Don't know how to get it from here to there? Don't worry, we do. The professionals at Pak Mail Chapel Hill specialize in large item packing, specialty crating and shipping services. We handle any size any weight any shape with expertise, efficiency, and security. 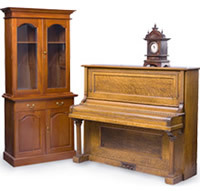 We pack and ship oversized individual items, such as armoires and grandfather clocks, as well as artwork, antiques, equipment, and high-tech electronics. We also pack and ship entire homes, offices, and warehouses. With our customized large-item packing services and preferred network of specialized carriers, we can ensure the safety and timely delivery of your shipments. Pak Mail Chapel Hill is a full service packing and shipping store as well as a custom crating and freight shipping company. We are located in Chapel Hill and proudly serve Chapel Hill, Durham, Raleigh, and the entire Triangle Region. Request a Free Online Estimate or call us at 919-967-3020.